Why would anybody write a review of the Rhodia Dotpad? It’s ubiquitous—everybody’s got one, they’re everywhere, and they’ve been around for years. Everybody’s got one, and they’ve been around for years. There must be something about them right? So what’s the fascination with this little pad? First-off, it’s small; which in this case, is not a bad thing. It’s a rectangle of about 85 x 120mm (3.3in x 4.7in), and less than 10mm (<0.5in) deep. It fits in every kind of pocket from dress-shirts to jeans, handbags and purses to the side pocket on a rucksack. They’re even great to carry in the front of the car… in case you ever find yourself exchanging insurance and witness details (er, for example). 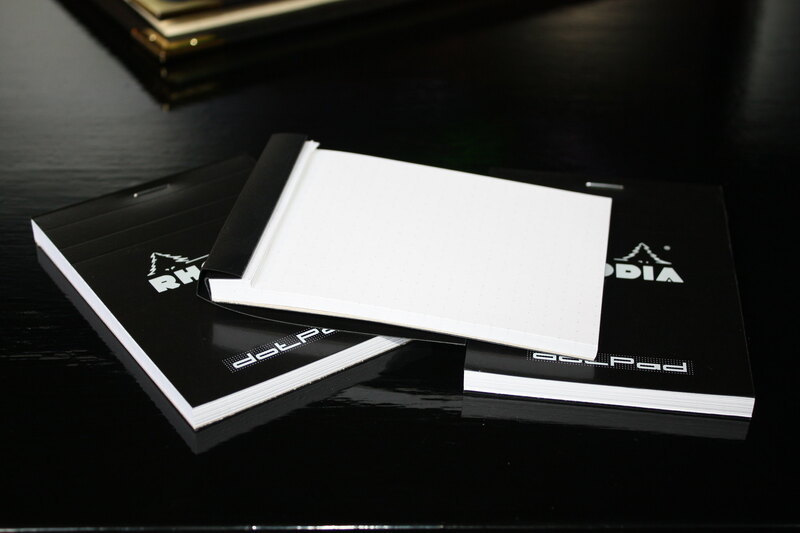 Each pad contains 80 sheets of Rhodia’s crisp, white 80gsm paper, in the subtle dot-grid (Dotpad, get it?) format. There’s no bleedthrough when you use fountain pens from fine to double bold, and no feathering of the ink. It handles ballpoints, gel pens, and pencils with equal aplomb. The front cover folds nicely over the back whilst in use, made easier by the indented lines at the top of the cover: Attention to detail. And if you ever want to compare writing or ink samples, like some strange people are wont to do, then like I said, everybody uses a Dotpad, and you know you’ll be comparing two similar samples. 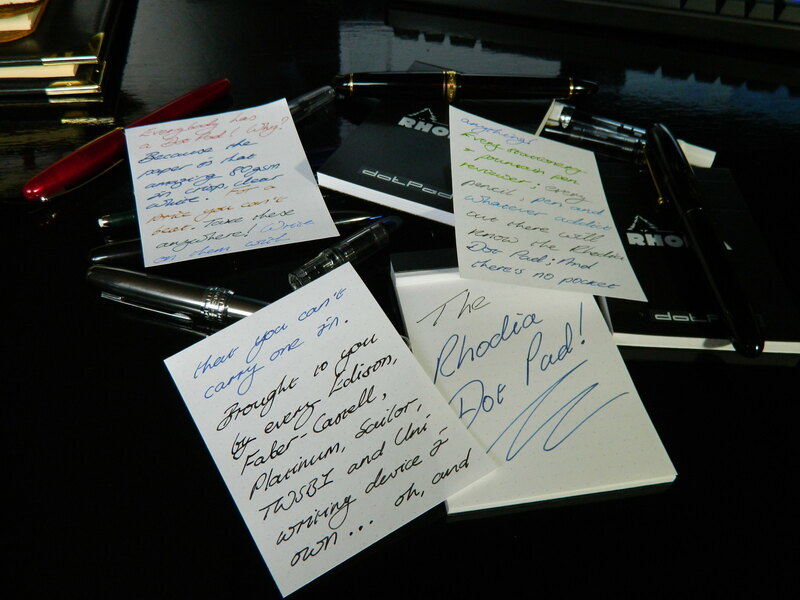 Most [of] my ink reviews are done on Rhodia 80gsm paper, in the staple-bound pad. It’s for me to try to be as consistent as possible, it’s a fairly easily accessible paper so many people have experience with it, but it’s also just great paper. 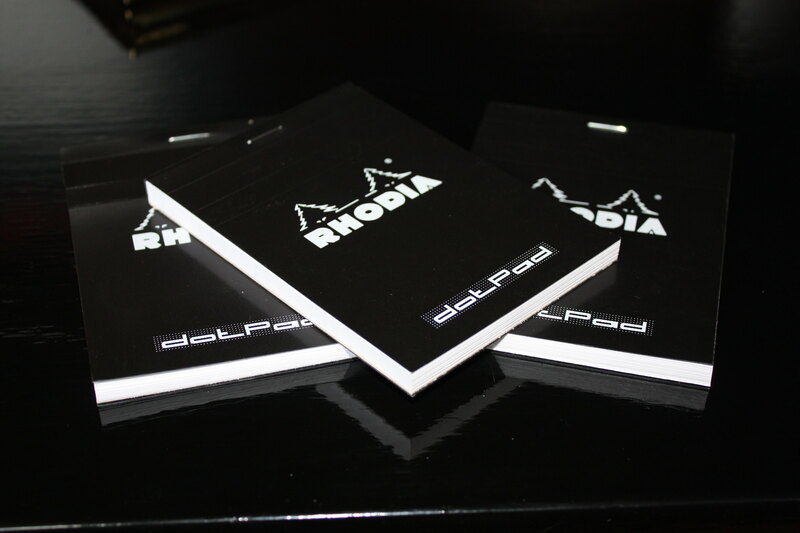 The notebook contains 80 sheets of Rhodia paper (80gsm), which is a favorite among many, many people. Rhodia makes fantastic paper, and this notebook is no exception. It can handle anything you throw at it, including ink swabs from cotton balls, fat brush pens, and wide calligraphy nibs. If you’ve ever used Rhodia paper, you know what to expect. If you’ve never used Rhodia, you’re in for a treat. I can’t think of a bricks and mortar, or online stationery shop that doesn’t sell them. All my favorite haunts in Toronto stock the Rhodia lines… Take Note, Laywine’s, and of course, Wonder Pens. Though only Wonder Pens has an online store; and at $4.00 Canadian per book (as at July, 2017), I even buy them for my kids. What’s to say? The Rhodia 80gsm paper in whatever format you buy it is excellent. Whether you sketch, write or jot. The small format Dotpad is simply faultless as a carry-everywhere. It has both quality and cost on its side, and the paper is PEFC certified to be sourced from sustainable forests. Join the club, almost everybody else has. Next ›Which Nib is for Me?